The first year that you garden in a new place is always somewhat of an experiment. You never really know how what you plant will turn out. Will it thrive or will it die? I have been fairly lucky with my attempts at a small container garden this year. I wasn't really sure how the impatiens would do. I knew the area got morning sun, but it turned out to be a bit hotter than I would have liked. Even so, the impatiens in the larger pots have done fairly well. The ones in the smaller pots however, haven't done as well. I have tossed a couple of them and may lose a couple more. The impatiens that I mixed in with the herbs are growing nicely, and the herbs seem to love where they are placed. I moved the petunias over onto the garden stand. They love the hot sun they are getting. I have also had mixed results with the tomato plants and the one green pepper plant. The green pepper gave up the ghost. It has been tossed also. It produced two small peppers, but it was just in too small of a pot. The tomato plants on the other hand are producing in abundance. This next winter I am going to be on the lookout for some larger inexpensive pots. I would like to try growing some squash next year and maybe try another green pepper. I'm really enjoying having a little garden again, although I wish it was a little closer to my apartment. I would sit out there more if it was. I'm not giving up on having my own outdoor space again some day, and in the meantime I'm going to enjoy the fruits of my summer labor. Everything looks lovely. I remember in my first apartment in San Diego, the area outside my back door was all cement and it was so hot that nothing that I planted did well. Your tomatoes look yummy! I put the tomato plants on the ground next to the fence so it is not so hot. You're right though, the cement is really hot. Thanks, Diana. Maybe someday I will have my own outdoor space again. Really nice. I love potted gardens. They're so cozy and charming. Impatiens are one of my favorites! All of my tomatoes are still green. I've got a ways to go. It's been cool here.The past two days have been in the low 60's! That's life in New England! :) I do not miss the humidity of the south! Laura I think your garden did very well for a first year attempt. We also get so much sun it cooks our plants. We do get flowers but the one's in pots don't do as well as the one's in the ground. It's a learning curve! I'm not allowed to plant anything in the ground, so it is definitely challenging. The cement is hard on my plants. I've learned over the years that small pots just aren't going to make it in the heat. I got one great big plastic pot for my yellow rose at Walmart.com. It was pretty cheap. Might look there, or find end of summer sales. I'm going to scrub the small pots and bring them inside. I am definitely going to be on the lookout for end of summer bargains. Your flowers are so pretty! Most of my potted flowers are on a cement patio and it is a real battle to keep them alive when it's this hot. I do find the bigger the pots, the better the flowers do. I have never had any luck with putting tomatoes in pots, yours looks great! We container garden, too...yoyrs are lovely! I Can't wait until our tomatoes ripen! They look pretty wonderful to me, Laura! Of course my favorite is the tomato. I've not been able to garden for about 4 years, but hopefully next year will be better and I can at least get some good container gardening going. Enjoy those tomatoes! I've purchased some really large lightweight pots through Sierra Trading Post and also Walmart. 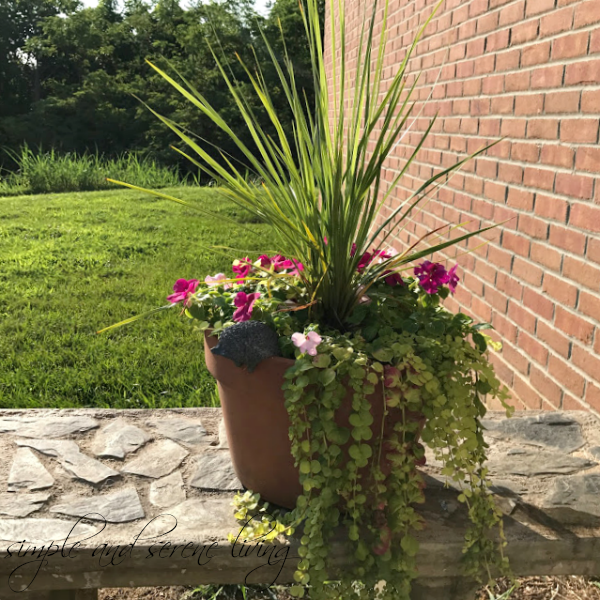 I had a container garden at my rental house, and it saved my sanity! Gardening and plants....they are so good for the soul aren't they? i loved knowing you through your "about me" my friend! you are beautiful lady with elegant personality and warm smile . you have lovely family,may you be blessed with more and more joys of life ,amen. i lOVED your plants and pots, they are gorgeous and lovely ! unlike you our container plants grow until certain time and then die ,don't know what is wrong. best wishes for your next plantations plans. One of my favourite bits of our garden is the patio just outside where the two Adirondacks live. You remind me to appreciate that space more.